WCS has worked to save Magellanic penguins since 1982. There are few species that represent the coast of Patagonia better than the Magellanic penguin. Wiry birds with tuxedo-like markings, they can survive at sea for more than five months at a stretch. We now know these birds migrate more than four thousand miles on the ocean, live over 25 years, and keep returning to the same nest and partner, if they can. 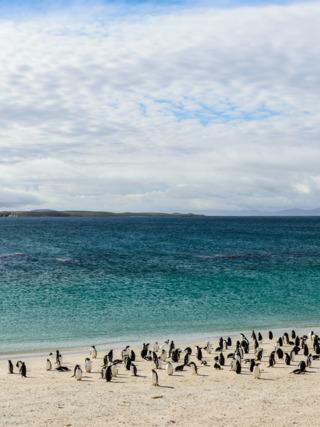 Penguins in Patagonia have suffered threats including pollution at sea and habitat degradation on land. Currently, they also face negative impacts from climate change. WCS has been supporting over 30 years of long-term research and monitoring of this iconic species, and works to conserve them by helping improve the management of commercial fisheries and of offshore drilling and the transport of oil in the Southwest Atlantic. Additionally, we currently work to protect the core reproductive sites of these penguins in coastal Patagonia in order to ensure their long-term survival.